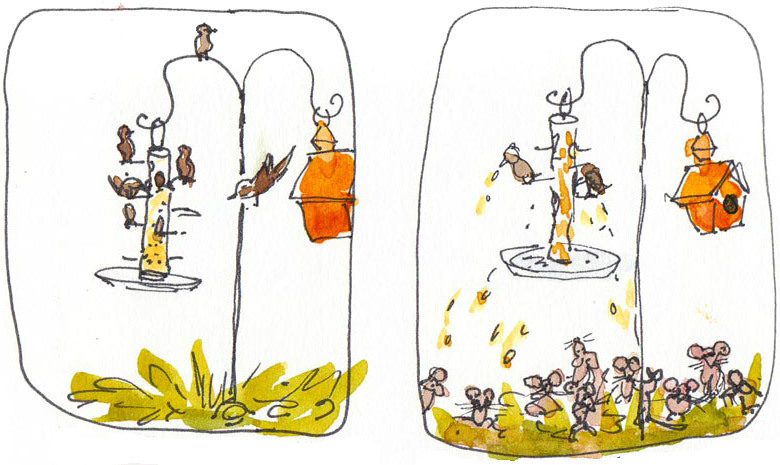 I used to love feeding the birds and seeing my little customers flocking to the feeder. But one day I thought I saw the wood chip ground covering moving under the feeder. When I looked closely I saw it wasn’t the tan bark moving, it was dozens of mice! By feeding the birds I was also nourishing a growing army of mice with all the seed the birds scattered! I called “Vector Control” (a euphemism for the county rat patrol) and an interesting female rat inspector came out and inspected. She told me the only way to get rid of the mice was to stop feeding the birds and that for each mouse I saw there were 50 more I wasn’t seeing. I was sad to stop feeding the birds but it was better than the alternative (which included multiple mouse traps, even sadder). Meanwhile, the spilled millet seed grew into a lovely, tall, feathery bush under the feeder, which I left hanging in a bit of wishful thinking that one day I’d be able to return to feeding my feathery friends. 3. Millet grass grows under feeder ---> ---> ---> --->4. Wasps move in. A couple years pass, the feeder and bird house remain empty and the millet bush continues to be a pretty garden feature. 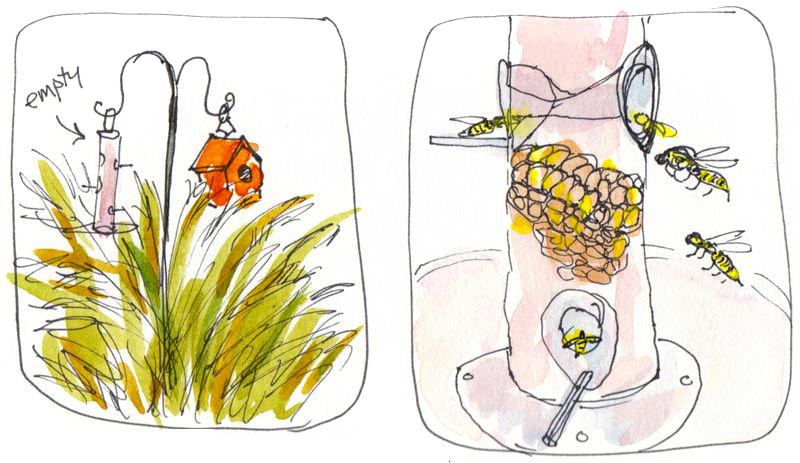 One day I notice something odd: wasps are buzzing in and out of the feeder and have built a nest inside it. I learned that while wasps do not pollinate like bees, they are still beneficial because they eat insect pests in the garden. I decided to leave them alone and enjoyed watching them care for their babies (larvae) in the nest. Wasps eat potential garden pests including the venomous black widow spider. Adult wasps eat only pollen and nectar (or your soda at picnics). They only hunt for meat (insects, worms, your barbequed hamburgers) to feed their larvae. Wasps nests have only one purpose: to ensure the production of young. At the end of the nest’s cycle, every member of the nest, except emerging queens, dies. I guess things got a little crowded in the nest because the wasps started hanging out at the neighboring empty bird house too. Then one day we had a scorcher of a summer day. The temperature in my usually cool and foggy neighborhood by the Bay was in the 90s (f). 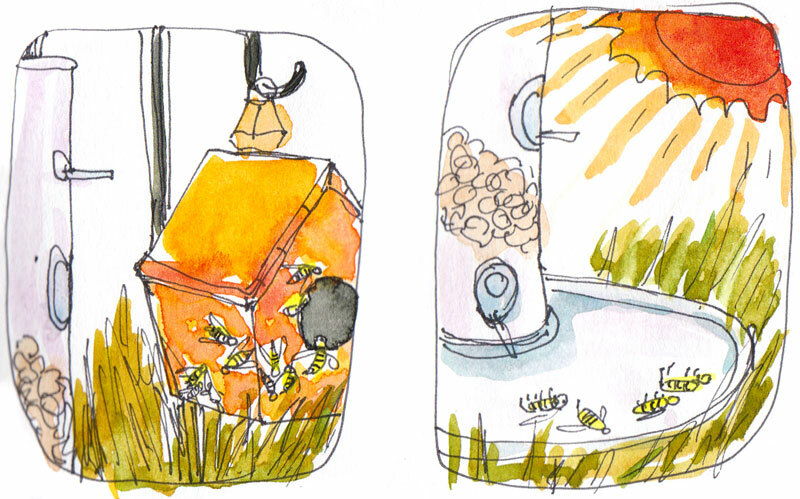 The clear plastic bird feeder turned into a greenhouse and cooked all the wasps in the nest. So sad. All those poor little larvae, all that building and hunting and gathering of food. The stalks of tall millet grass made a perfect ladder for the gazillions of ants who live in my garden (and don’t even get me started about the ants and their nasty aphid ranches). 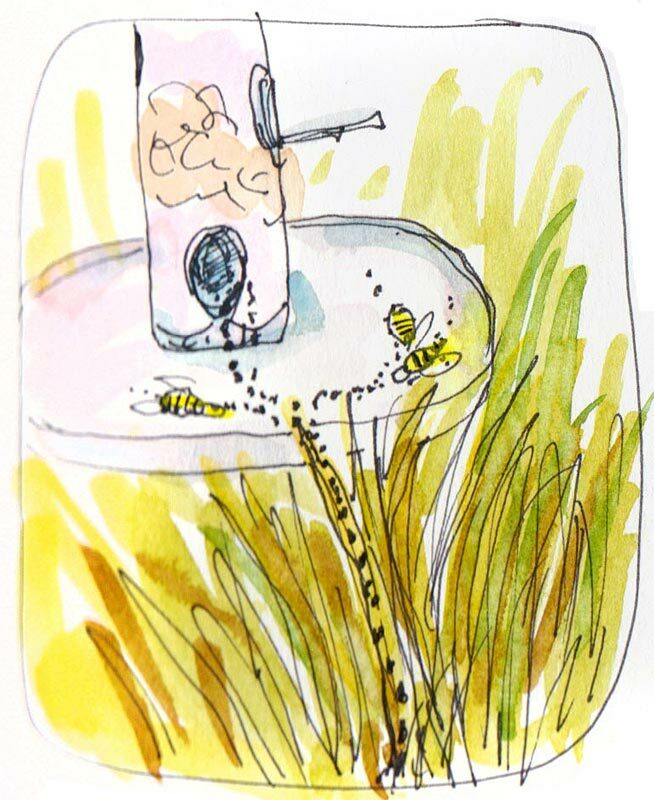 The ants were streaming up the grass onto the feeder and having a lovely dinner party of roasted wasp. And because my garden is well stocked with ants and aphids, I am, in a way, still feeding the birds. They still flock to my garden, but now they eat the ants and aphids off the rose bushes and it doesn’t even cost a penny in bird seed. Well, Jana, a hard lesson to learn, but you’ve learned it with enjoyment. What a fun and illustrative journey through a cycle of life by your feeder, Jana. You were smart to let the wasps alone. We had a big storm out here in Big T and it turned my busy bird feeder upside down, where it hung on the fence. The wasps had not waited for it to be abandoned but had moved it with the birds, who were now sitting on the fence, trying to figure out how to get in there to the seed. So I made a big mistake when I tried to turn the feeder right-side-up. Five wasps lined up on my hand with the precision of a firing squad and bit me under each finger and my thumb. Then this protective army frizzled under our hot sun just as yours did. It is sad that when we try to be part of the life cycles of nature we may encourage problems in our own lives. I adore mice but not when they collect into a crowd and are outside my house planning a way to get in–and they’ll sure enough make a way if they can’t find one. Ouch! Sorry to here about your stings but your description of it was brilliantly written. I could just picture the birds on the line and the firing squad on your hand. I think mice can be cute, but these guys actually had started finding their way indoors, requiring sad traps that broke my heart. The vector control lady told me they can get in the tiniest cracks you wouldn’t thing a bug could get through. I sealed everything up and quit feeding the birds and after a couple months finally was mouse-free. What a beautiful illustration of the interconnectedness of all beings. 🙂 Lovely work as always. very interesting story how one thing leads to another. They can say what they want about wasps being beneficial because they eat other annoying insects, but I figure the wasp is more annoying than any other….like Annie, I just got nailed by two. Also, like Annie said when we try to be part of nature’s cycle we seem to bring on more problems. I enjoy your writing. 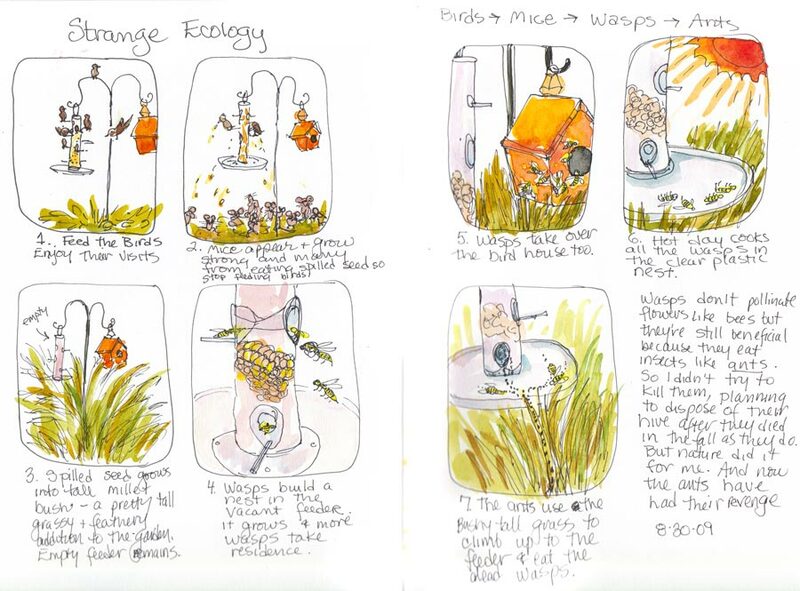 This was lots of fun to read, and I love your illustrations, although the part about the mice made me very uncomfortable – I’m terrified of rodents! It’s a small-scale version of the crazy things that keep happening as humans interfere with nature – and I love the way you bring it full circle. Cast Stone Wall Fountains and Garden planters information on selecting, planting and purchasing all types of outdoor planters for container gardening on your patio, balcony and home landscape. I wanted to thank you for this great read!! I am definitely savoring every little bit of it. I have you bookmarked to find out new stuff you post. “If only they made birdseed that was poisonous to mice. Have you tried one of those Victor Multi-Kill traps? I heard they kill ten at a time or something crazy like that. Or maybe you could just get more cats.